OCEAN BEACH, CA. 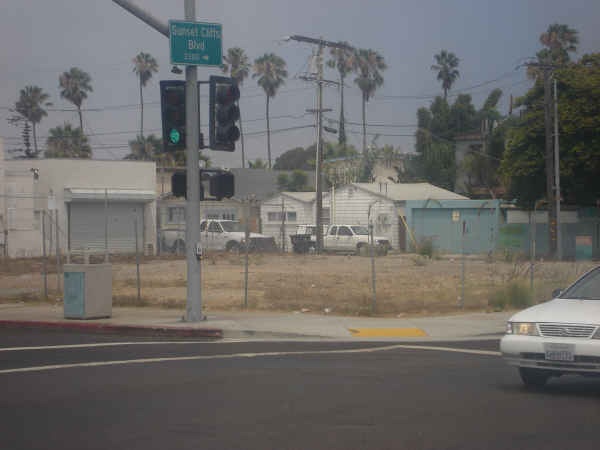 No other corner in all of Ocean Beach has had as much attention and been the point of so much contention and conflict within the community as has the corner of Voltaire Street and Sunset Cliffs Boulevard. The northwest corner to be exact. For more than ten years, this corner of contention has experienced divergent forces of the community pulling it in different directions: from a gas station to a popular recycling center, from plans for a community center, to plans for another gas station, then to an illegal but community-supported garden, and then more gas station plans – and for the last six years, an empty ugly lot. Now the corner’s last chapter seems to have begun, as the OB Planning Board just approved the construction of a two-story medical office building, Sunset Plaza, at the behest of the owner, World Oil Company, a Los Angeles County-based corporation. Voltaire and Sunset Cliffs. This is a busy intersection. With a Shell station on one side, a busy Jack-In-the-Box kitty-corner, traffic and pedestrians flow through it like the ocean flows upon the nearby beaches. Back and forth with the tides – back and forth with the traffic. It’s definitely a key intersection – a block from OB’s entryway – where two great local avenues meet and cross. It’s where Sunset Cliffs, the primary entry and exit road for the community, and Voltaire, one of the most visible and active of the east-west avenues on the Peninsula, come together for a short but active patch of asphalt. On a sunny summer afternoon, the movement of people and machines through this exhaust-filled crucial roadway of the community is constant. If not an entryway, the intersection is certainly a gateway to our seaside community. It’s not a good corner for a service station because when you go into it, you cannot get back out. Our business suffered a great deal when we moved there. Dees also had tough competition as there was three other stations all within a block of his establishment. At any rate, the corner became empty for the first time in a long, long while. Yet, the building remained mostly intact. OB Recycling – forced to close? That building would later come in handy. For in the late Eighties, Mike Regan opened up a recycling center, called Ocean Beach Recycling (OBR). It flourished for nine years, allowing residents and businesses to drop off paper, glass and most metals for money. It also met the State recycling requirements for the entire community, allowing all of OB’s markets to rely on the center for their own recycling requisites. Remember, these were the days before every home had its own blue recycling canister. Now, not everyone loved the recycling center. Some neighbors and businesses were put off by the many homeless who were attracted as here was a place they could bring their gathered bottles and cans. And then just hang out. While the site laid fallow, the OB Community Development Corporation, a non-profit development entity, tried to acquire it. The OBCDC wanted to include the parcel in the group’s master plan to improve the entryway into the neighborhood – a project on another corner the CDC is still involved in today. The then-executive director of the non-profit, Robert Villareal, told the Beacon that they had hoped to build a community or senior center at the location. His board wrote a letter to World Oil requesting the company donate the property to its efforts. They never got a response. World Oil bulldozes recycling center, April 1999. 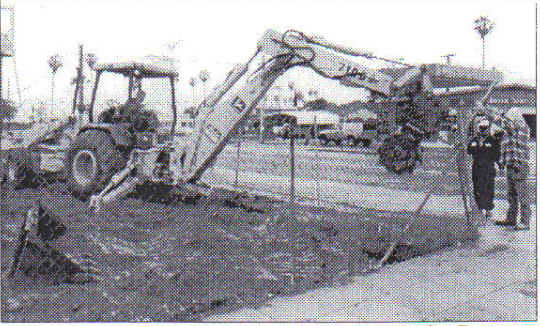 It wouldn’t be until April 1999 that World Oil Company, the property’s owner, would bulldoze the old recycling center. There were more rumors and talk of a pedestrian plaza and an In-N-Out Burger going up in its stead, but they remained just that – rumors. By September 1999 – ten years ago – it became apparent what World Oil wanted to do with the lot. It wanted to install an Exxon service station at the corner. Exxon? Yes, Exxon! World Oil’s plans included a 686 square-foot kiosk with three pump islands with a 3200 square-foot canopy, and had,of course, to go before the OB Planning Board for approval. Kruegar and many other OBceans remembered Exxon as the giant oil company responsible for the 1989 Exxon Valdez oil spill up in Alaskan waters. Petitions opposing the station started to circulate. Signs denouncing Exxon appeared up on the corner’s fence. One read: “Exxon Go Build in Hell”. When the signs would be removed, more would appear over night. Opposition to Exxon and World Oil from Voltaire Park. Steve Jurman, World Oil’s representative, also talked to the Union-Tribune reporter, Michael Stetz, alleging that World Oil had not detected any backlash yet. This was in early September. The company’s plans were to be presented at the September 15th planning committee meeting. Jurman told Stetz – who now lives in OB – that a gas station would benefit local residents with cheaper gas. Jurman couldn’t understand why a protest movement was developing, as most OBceans own and drive cars. “If their principles held true, nobody there should drive,” Jurman said. But the signs proliferated: “Exxon Go Home”, “Exxon is no good for OB”. The community also heard that Exxon planned to erect a 30 foot by 11 foot sign that said, of all things, “Exxon”. This added insult to outrage. When September 15th rolled by, a couple hundred residents and business people packed into the OB Recreation Center. There had been so many people, the meeting had to move into the larger gymnasium to accommodate everybody. 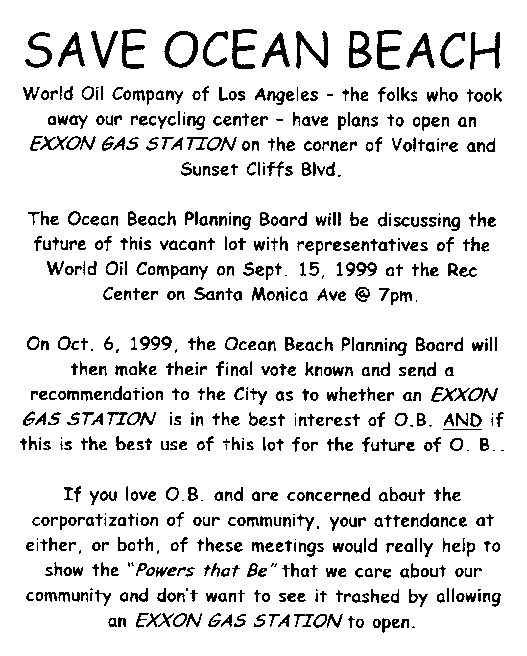 Flier distributed in September 1999 urging residents to attend OB Planning Board meetings to oppose Exxon. Kip Kruegar was running the meeting, as chair of the Land Use Committee of the Planning Board. City Councilmember Bryon Wear was also there, fielding questions. When pressed by yours truly – I was at my first community meeting in years- Wear would not come out and explicitly oppose the gas station, falling back on some face-saving nonsense, declaring that he could not take a public stand on something that he may have to vote on. We don’t like dirt lots. The gas station is going to have a clean image and a very good-looking location. It won’t be an eye-sore. We like family-owned businesses in OB. We need to keep out franchises. When you say dirt lots, we like dirt. The community has an interest in nature, even a vacant lot has merit in this community. Other residents argued that having another gas station is over-kill because of the proximity of a number of other gas stations. OB had four gas stations at the time – as it still does. Another gas station would also increase traffic in an already congested intersection, many pointed out. I really don’t believe that a majority of the people in OB want to pay $1.55 for gas. I guarantee that prices will definitely drop if we are there. If people had the choice of paying $1.29 or $1.55 they would like us a lot down there. We know, if this station was open today, we’d be really busy and our customers would not be from outside – they would be Ocean Beach residents. The service station does not compliment the master plan for OB, which was designed to beautify, enhance the area and improve traffic flow. I believe a gas station there does nothing for these goals. On October 5th, the full board voted unanimously to oppose the plan. When the City Council received the project, they voted against it too, and sent World Oil ten pages of questions and changes to implement before they would consider it again. The community breathed a sigh of relief. This was the fall of 1999. And by April the next year, 2000, World Oil still had not responded. Meanwhile, the lot just sat there, fenced in, gathering weeds, trash, tires, old appliances. People used it as a dump site and old refrigerators, washing machines, green cuttings and construction dirt ended up there. Homeless folks began to gather in the back, next to the alley and out of plain view. The lot quickly became an eyesore, a sore spot in the neighborhood’s efforts to spruce Voltaire Street up. It looked horrible. Finally, in true OB fashion, about half a dozen neighbors and local residents took action. They somehow pried open enough of the fence to get in, and started pulling up weeds and collecting beer cans, Jack In the Box wrappers and other trash. This was in late February and early March of 2000. Kip Kruegar, who lived and worked nearby, seems to have been a central force in moving against the eye-sore. Suddenly, out of nowhere and totally unexpected, a popular 30-year old local baker, Mica Buzcova, died in her sleep. Locals were shocked and stunned. She had co-owned the original Bohemian Strudel Shop on Voltaire, just down the street from the lot. Somebody organized a memorial for Mica – at the same empty lot, as it was large enough to hold the fifty people who attended. They all had been invited to bring a plant, and many did, and planted them right there in the dirt. Over the course of the next days and weeks, more plants were brought to the lot and planted. More of the fence was bent over. More weeds were taken out. More flowers were planted. An elderly woman came and planted her herbs. The place was being spruced up, slowly at first. A toilet tank and seat sitting near a wall was left because it looked funny. People would come by and rake and shovel. Wildflower seeds were strewn about. OBGO activists and friends make a garden. And all at once, everyone knew it was happening. A garden was being born. Right there in the dirt lot, next to the old, decaying asphalt from the old gas station days. 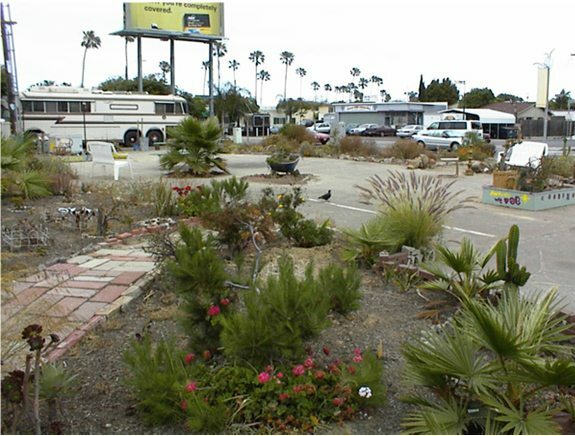 Voltaire and Sunset Cliffs had become a garden – a park with trails amidst trees, bushes, flowers, native plants, cacti, palm trees, pine trees. A large sign was hung up on the fence. This one declared: VOLTAIRE PARK and beneath it was the famous quote from the French philosopher “We must cultivate our garden.” This phrase attributed to the great libertarian would become the slogan for the entire street – today you can still see little wooden plagues with the saying nailed up and down the two or three blocks of Voltaire as it speeds towards the ocean. Gardeners of Voltaire Park – OBGO sponsored work party. More and more neighbors took part. Strangers would drop off more plants and flowers. Bushes and small trees went in. 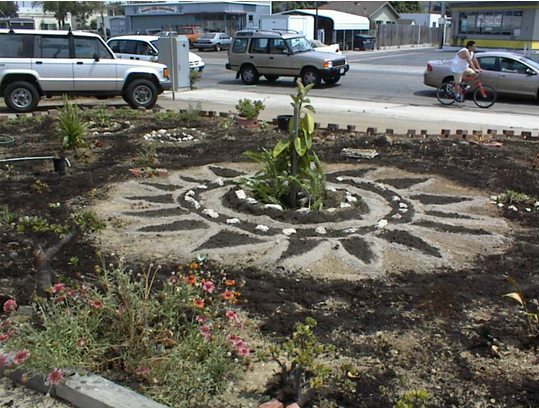 When supporting the Garden was proposed to a newly formed activist group, the Ocean Beach Grassroots Organization (OBGO), it reacted with near-wild enthusiasm. OBGO would take the Voltaire Garden to new heights, organizing work-parties, where dozens of residents showed up, digging, hauling, planting, raking, weeding, prying up and taking a pick axe to the asphalt, making brick trails and walk-ways, painting wooden pots and containers, installing benches. People traveling by would stop and ask what was going on, and when told, some joined in. Cars going by would honk their support. This went on for months. On July 4th, Independence Day, the rest of the fence mysteriously disappeared. A watering system – a long hose – was set up with the help of a local business and with OBGO footing the bill. The magic of the garden appears. During the Spring of 2000, the media discovered the garden, Voltaire Park. And the reporters also discovered that much of the community supported the home-spun renovation and beautification project, even though it was all technically illegal – using another’s land. But many locals simply shrugged. World Oil had left an eye-sore and refused to deal with the mess, so OBceans jumped in and cleaned it up, making a thousand percent improvement. What was the problem? “It’s a very OB kind of movement,” the Beacon quoted Robert Villareal, the director of OBCDC. “Obviously, it’s trespassing,” shot back Rehklau of World Oil. He told the press that he hoped the effort to make a park would be discontinued and cleared up. 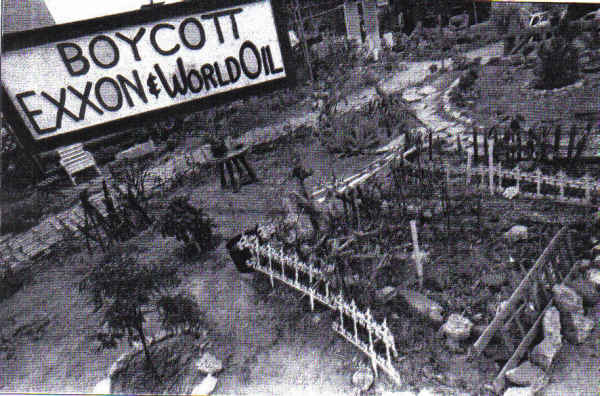 The community would soon find out the extent of World Oil’s opposition to the garden. The company came flying back with yet another proposal for the Exxon gas station, and as before, it had to go before the OB Planning Board again. A huge sign appeared at the park: “Boycott Exxon & World Oil”. The OB Town Council took a vote on the project and rejected it. It was deja vu. Exactly a year after opposing the gas station, the Board was presented with another plan for another Exxon station. This time the Beacon reported that 130 residents attended the September 6th planning committee meeting. (The U-T said 200.) Aesthetics, traffic congestion, and an unbecoming entryway for the community were the main concerns of those who attended. Pete Rehklau, of World Oil, again warned residents that they would take over the land and that people needed to get their stuff out. … we are going to regain control of that property. The people who have stuff there should remove it, or it’s going to be tossed. I can’t say when that is going to be, but it is going to be sometime in the near future. Applause broke out when the Board – again unanimously – voted to oppose the project. Even though the vote went against World Oil, several Board members made it known that they did not support the garden, Voltaire Park. Everyone knew that World Oil might appeal, take their case to the San Diego Planning Commission. But in the meantime, the community enjoyed yet another victory against the LA company. There was talk – this time of World Oil selling the land. Yet, the community was still split on how they reacted to the garden. Some despised the idea that private property laws were not being observed. 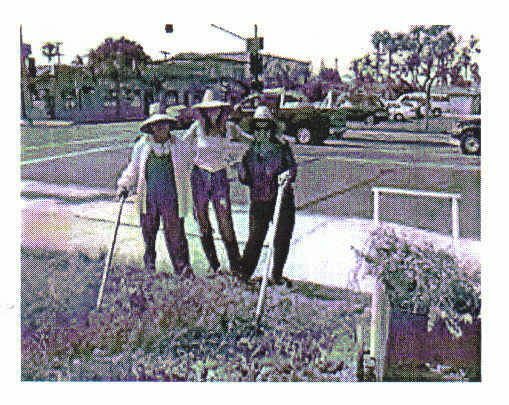 Yet, even Councilmember Wear – to his credit – would not openly condemn the gardeners. “Ocean Beach people,” he said, “have always been spirited debaters in public policy.” Many residents and some businesses accepted and even supported the grassroots park. For a while, World Oil dropped out of sight. The garden was kept up. An occasional work party was organized by OBGO. 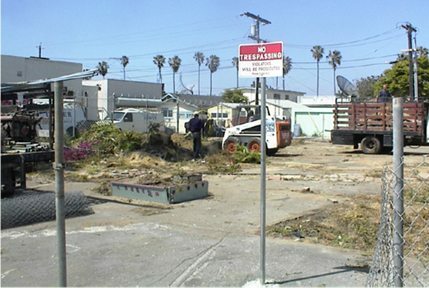 At one point, the City gave OBGO notice that it would fine the property owner if certain dumped items weren’t removed promptly. World Oil complained that if they were fined, they would close the Park. OBGO, working with World Oil, assured the City that it would do what was needed and cleared the site of its last old appliances and dumped items. Yet, once again, the OB Planning Board was hit with a re-file by World Oil. It was coming to the Board for a third time with plans for – you guessed it – a gas station. It was during the period of 2001-2002 while I sat on the Planning Board that World Oil returned. The Planning Board had changed somewhat. 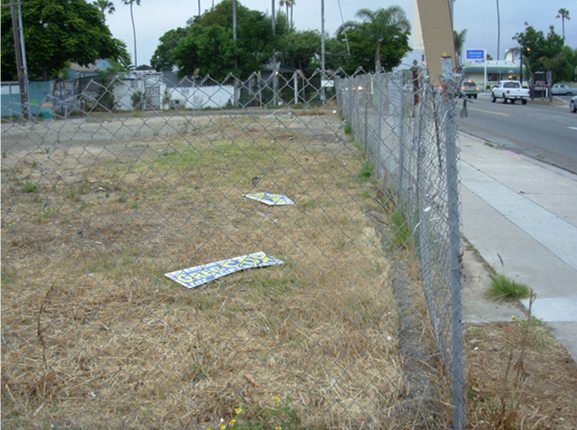 During its Spring 2001 election, OBGO had fielded a slate of anti-development activists – and had swept the election. After this sweep, OBGO maintained a majority on the Board for a couple of years. I remember very well the City’s objections to the new set of gas station plans: there was simply not sufficient egress and ingress for the large tanker trucks that would need to enter and leave the site. The Board and the City opposed the plans, and for a third time, World Oil lost its gas station. Things quieted down. A few gardeners would tend to the lot. The cars would still whisk by. No one seemed to care that a Park existed on private land. 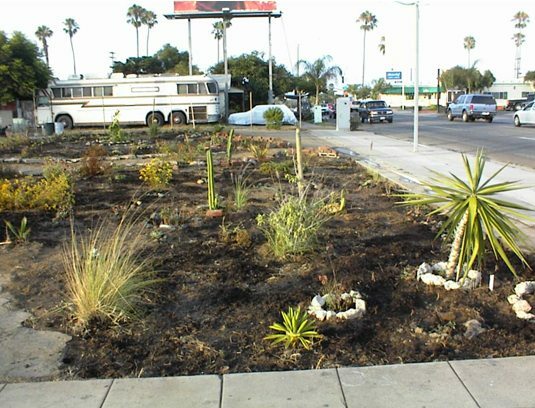 May 15, 2003: World Oil bulldozes Voltaire Park without notice to OB under the protection of San Diego Police officers. As it turns out, it was too quiet. On May 15, 2003, World Oil played its hand. Without warning or notice to the community, it came and destroyed the Park. Accompanied by a van of San Diego police officers, a work crew with bulldozers arrived and began undoing what the community had planted over the last three years. (Here is how the then OB Rag reported it.) A few locals scurried about and tried to save as many plants as they could. Six years have now passed since that day when Voltaire Park was taken out. The fence has remained, the weeds have come back, and the ubiquitous trash collects. Political elections signs are popular on the fence. They stay there weeks after the elections. No one seems to care. World Oil has come back. They purchased the old Dover Plumbing building and land next door to the vacant lot sometime ago. They have proposed, and this time the Planning Board has accepted, plans for a large two-story medical office building with it own parking lot for the site. This was in early August. The Board placed a few conditions on the project, to make the building more green compliant primarily. Ten years from the day World Oil was first denied their gas station, they finally got their project, Sunset Plaza. World Oil bought the Dover plumbing parcel in order to have enough land for their Sunset Plaza project. Photo taken August 20, 2009. OB’s corner of contention has certainly seen its share of conflict. Next time you pass through that intersection of Voltaire and Sunset Cliffs, take a gander at this historic corner and appreciate all the conflicts and divisions over this piece of land, and all that has passed over and through this vacate spot of earth. It won’t be vacant for long. Seems the last contention has died down. Frank-The entire fence (xcept for the locked gate-hee,hee!) came down on a July 4th during the firewurx when the cops were busy chasing alcohol soaked marshmellow fiends. A passerby reportedly asked the guy on duty at the gas station across the street if the scandal-us activity shouldn’t be reported to the po-lease and the guy just shrugged! I would say the current state of the lot speaks volumes about how much World Oil cares for our community. thanks for the history lesson Frank. I agree with Abby – the fact its remained vacant for so long says something about how much they care about OB. The other side to the argument, however, is how much longer will it remain vacant if nothing is proposed? At least we know they are trying again to build something….if Sunset Plaza doesn’t work out, and the community doesn’t supprt it, hopefully they’ll come up with something more appropriate for OB – and start building it soon. most OBceans own and drive cars. “If their principles held true, nobody there should drive,” Jurman said. This comment cracked me up. In one way, it could be seen as blaming the victim of an oil addicted society. One of the many things I love about living in OB is that I don’t have to drive. I can walk or ride my bike anywhere. Now, obviously I have to drive sometimes because, contrary to popular belief, I do leave OB from time to time and I work downtown. But the fact is, OBceans probably drive less copmpared to any other community in San Diego. And there was and still is no reason to have more than 2 gas stations in town. By the way, what’s up with Shell??? Does anyone go there? It’s consistently $.20 or $.30 more expensive than Arco on any given day. I hope that the OBPB reads this as they’ve obviously forgotten what a horrible fit World Oil/Marketing Corp. is in Ocean Beach. It should also be noted that the final piece of the puzzle was World Oil’s acquisition of the Dover building/lot. That is key in that they now have a lot the same size as Jack in the Box and that once they build, there will be no stopping them. I also take exception to OB People’s Food Co-op’s Nancy Casady’s statement, “We certainly noticed that once the recycling center closed, our (transient) problem went away.” Because nothing could be farther from the truth. If only all that fine volunteer effort had been focused on cultivating OUR garden at Sunset Cliffs. Historical revisionism aside, Frank makes a solid point when he indicates the “OB Entryway” is more than a slope on the NW corner of S.S. Cliffs and W.Pt. Loma Blvd. Tony Kempton of the City SD advised the OB group to give traffic/parking issues primacy in their deliberations. With Hwy.8+W.Pt.Loma+Voltaire+Nimitz+$eaWorld drive all funneling into an OBentryway, the elimination of a future widenening of S.S. Cliffs by boxing in that intersection makes no sense in a world of rational community planning. but I digress. Kip oppsed Nancy Casady’s People’s Box on those very same grounds. From the point of view of public safety imagine the difficulty of emergency vehicles to transit, the angular parking on Voltaire not withstanding. The problem that the Land Rover liberals have with the “homeless” is that the houseless and other non-owners of OB see through their self righteous BULL$H1T more than any other group of OBCityZen. Big Box on Voltaire, kids. Take it from the gut, if you dare. Tip of the hat to Colleen and Kim for keeping old newsclips and for allowing me to use them for this post. This proves there’s something to be said for stowing away old newspaper articles – often they are NOT on line or in archives. Thanks to the Beacon also for keeping on top of these issues over the years. I agree jon, one of the best things about living in OB is not needing to drive much. I suspect you are right about OBecians driving less. The love I felt for Voltaire Park came rushing back so fast as I read your article that my eyes filled with tears at the realization of the real loss our Community endured when World Oil w/the protection of “America’s Finest” bulldozed our community garden. 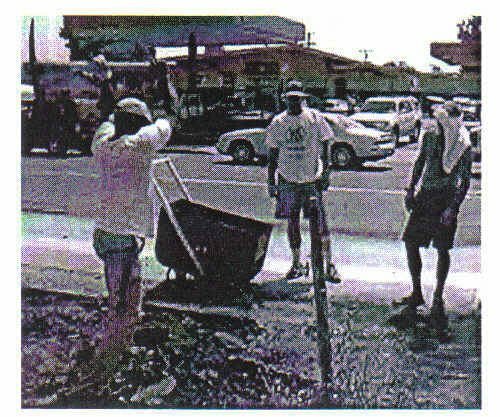 Ocean Beach’s children, teens, adults, and seniors all contributed to the cleaning, planting, painting, weeding, art, etc….of Voltaire Park. Voltaire Park was truly energized by Community spirit! I remember Ocean Beach Elementary students coming to plant seeds at the garden, as a learning tool, to observe their sprouting and growth. This is a prevalent property in our Community and I find the idea of a two-story, 30′ high, block-of-a-building a shameful addition to our landscape. In my opinion, the current owner of this property is a fat-pocketed, greedy, selfish corporation with no accountability, that doesn’t even consider the impact of their actions on people, on wildlife, on the environment, in any sense what-so-ever. BIG BOX DEVELOPMENT OUT OF OB!! WAYGO KIM!-FLOAT LIKE A HAWK ON SPIRIT WINDS AND STRIKE THE VERMIN AS LIGHTNING! this has a lot of history to ponder … from my count, the community had the garden from march of 2000 to may of 2003, so, larry, for 3 years, this was the garden of the community. a community can have more than one garden. it wasn’t wasted – see kim’s comment. there’s something to be said when dozens of residents come out and work on something like this for years. lane, i’m afraid it is a done deal – the next thing to occur is for construction to begin. and it will be sunset plaza, da tah! World Oil/Marketing finally started cleaning up the garbage in front of their vacant lot today. I guess after 6 years they figured it was finally time to police the area. 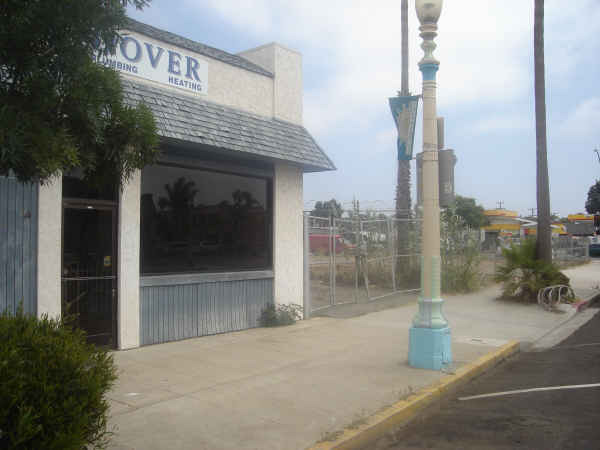 It’s a sad day in Ocean Beach when a Los Angeles corporation sets up shop at the entrance to our community and the local people are powerless to stop it. I agree with DG, that comment is offensive and clearly a put down. Plus, its just not true. THE AUDACITY OF HOPELESSNESS-is what I get from reading the comments of those who sing the song*. Did I not make myself clear that there is an opening in Public Safety and Transportation (in addition to others)elements of the OB Precise Plan as well as in the directives of the City of San Diego? And World Oil has to appear one more time to sanction their revisions. Remember IT TAKES A FIGHT TO WIN! -Peace Out,w/apologies to Phil Ochs? Not trying to make an argument that World Oil *isn’t* a greedy, heartless corporation… but, they sure do make some oddly unprofitable decisions. Dear Ohbeans. I don’t know if you remember a little girl from China with long braided pony tails and a hat with an old china man who helped in the park albeit breezily. Nevertheless, the greedy World Oil Company, as a symbolic gesture, should bequeath the properties back to the historical preservation of Ocean Beach. Although wishful thinking. Within fifty years the oil companies will fade away a victim of newer energies and efficient technologies advocated by my generation (I’m very young). We must not forget the American Indians, from the inland area, who once walked by the San Diego river marshes (including World Oil Companies property) to the beaches to catch their fish. Can anybody tell me why all of these independent gas stations exists? I wouldn’t trust them, fact — you cannot run a gas powered mower or weed wacker on gasoline, it will gum up the carburetor as a result of the Ethanol, those fish eyed fools (oil companies) use. I do not like the idea of a medical building that was once on a gas station, think fumes. The whole idea stinks bigtime. I love you all O’beans.